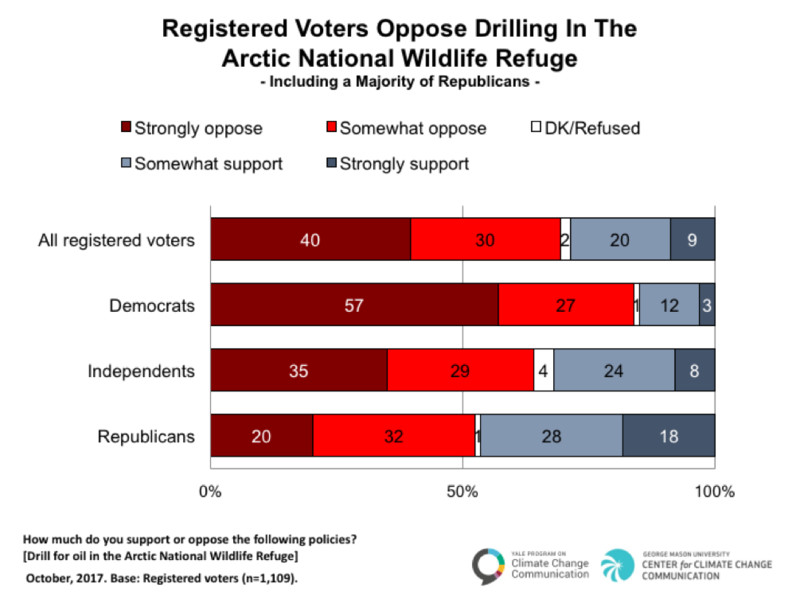 In our most recent nationally representative survey, conducted in late October, we found that a large majority of American voters (70%) oppose drilling in the Arctic National Wildlife Refuge. Those strongly opposed outnumber those who strongly support the policy by more than 4 to 1. For more information about the survey methodology, please click here. Leiserowitz, A., Maibach, E., Rosenthal, S., and Roser-Renouf, C. (2017). Americans oppose drilling in Arctic National Wildlife Refuge. Yale University. New Haven, CT: Yale Program on Climate Change Communication.